Implementing CRM strategies can benefit small businesses, just as they do their large-company counterparts. 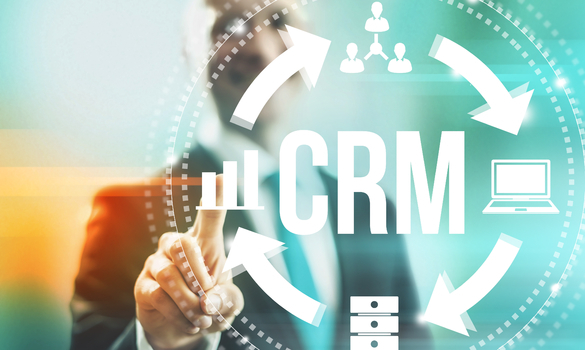 Each business, small or large can use CRM to track all of the customer relationships they establish, in hopes of learning what to repeat to ensure more satisfied customers. CRM makes continuing contact with clients seamless between employees. It promotes staff to continually be working towards finding more clients. One of the main methods of increasing your bottom line, and overall sales, is to expand your customer base. Using data from your customer history can indicate what methods are best used to approach which type of potential customer. CRM is short for Customer Relationship Management. It is a system that tracks different matters pertaining to customer service and sorts this information so it can be accessed easily. After understanding what is CRM, it is vital to know how it can transform data that is not being used to important stats that are relevant to your bottom line. This allows businesses to study customer relationships and all of the data involved with it. One of the greatest aspects of this system is how it stores current and prospective customer information for analyzation. These basic operations will carry through all different providers of CRM. The varying software can be found on the internet and accessed by any member of the business with clearance. An organization is what CRM was born to do. It takes all your customer info and gets together in one place. No company can survive for long without organization. CRM can sort your past and potential customers’ info so it can be easily recorded and accessed. Information on prior clients can be lost if not organized properly. In most cases, your micro-business is not utilizing the gold-mine that is customer experience. Applying CRM practices will not only discover leads to prospective demographics drawn from prior customers but can examine which methods work best for that type of customer. This is one of the leading concepts to add to your list of how to generate leads. Using virtual storage is one of the best innovations in saving space and processing power on company computers. Your data will be able to be accessed on any of your company devices you enable, so everyone can be in the loop when a new order is made or lead is discovered. Business cloud storage is instantly backed-up, so it can increase any figures that are being lowered by lost information or misplacement of customer leads. Emails and texts are an important part of working with your customers. Companies can now share and keep track of exact correspondents that went on with each customer with CRM programs. This will increase customer interaction by knowing all of the communication histories of your business and that clients, which is found in one convenient location. A working relationship with your customers is vital to micro-businesses. CRM produce more efficiency when dealing with current customers. It is always easier to coerce an existing customer to buy again then find a new customer. Since most small businesses are short staffed, all responsibilities are left to a small number of people. Many important aspects of customer data can become lost when you have to physically search for it, or worse, remember it all on your own. CRM is a great way to double the efficiency of any department with all data being analyzed through systems instead of tired eyes. The effort of manually writing every detail into multiple logs can add up to a lot of time. Using CRM will make a difference to your bottom line because of the extra work tie you gain having everything on one system and account. It may seem like a hassle to do all of this ‘extra’ record keeping but you will begin to see the benefits immediately. Most of the information analyzed and kept using CRM is already written down somewhere else, so it is not that much more inputting than usual done by a small business. No more searching for contact info, wondering what happened before, or worrying about a missed detail. Every growing business will need new employees. CRM is a great tool to help new team members familiarize themselves with consumers, company policies and other information that is important for your type of business. CRM stores the most important information a company has- their customer data. This is a great way to know what approaches the company takes to initiate and keep a flow of sales. This is a great tool to help with that personal touch for each of your customers. Remember exactly what it was your consumer loved in the past so you can anticipate what they may want in the future. Unfortunately, consumers are bound to have a bad experience now and then. By recording customer history you can see exactly what happened last time and prevent it from happening again. It can become vital to keep people on the same page, even if the team is only composed of three people. CRM can keep everyone up to date from multiple computers, so no one misses a thing. Having your team working together efficiently is a vital way to enhance energy and find new small business opportunities for growth. If needed any employee can pick up where another left off or tell a consumer something different than before. With CRM software, consumers will begin to recognize that your company as one that ensures quality customer service and relations because of its dedication to consumer relations. Your company actually looks more official once it is not using paper filing systems or disorganized email records. CRM software is the next step to building and maintaining your micro-business with a professional appearance to potential and current customers. With these tools at their disposal, any company can begin working faster and more efficiently within their small business. Small businesses can be quick to think they do not need the tools larger companies to utilize. CRM does not only grow businesses’ bottom line no matter their sizes, but it also allows for advanced organization. This leads to more time for the business owner and staff to spend on the business matter that matter to expand their business and increase profits.